There’s a few factors to consider when thinking about the kind of door you want for the rear of your house; aesthetics, energy efficiency, and perhaps most importantly – security. Sure, a door could look great and help keep the heat in, but if you don’t feel safe in your own home then none of this matters. Perhaps you’re thinking about getting bifold doors but have been put off by the misconception that they’re not as secure as French or sliding doors. Fear not, bifold doors are just as secure as any other. 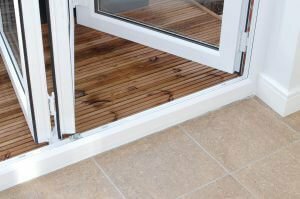 What makes bifold doors secure? Understandably, you might be looking to know what it is that makes bifold doors so secure, but it’s not just one thing, it’s a number of factors. As with all our doors, our bifold door range is part of Secured by Design, which is a police-backed standard of product that’s been specifically designed to reduce the rate of break-ins. Products with a Secured by Design status have proven to reduce home break-ins by up to 75%. You can feel rest assured that our bifold doors are as secure as they can be from this approval alone, but if you’re still not convinced then read on. Our bifold doors use a locking system that is sure to give you peace of mind that your property will not be vulnerable. Using a locking system consisting of 8 unique points, you can be certain that any wrongdoers will be deterred when faced with trying to crack it. Add in secure locking bolts and security hooks and you have a home that feels as protected as a fortress. It’s not just the lock itself you might be worried about, a big concern for some people is the fact that a bifold door, like many patio doors, consists of mainly glass. This can cause some people to think it would only require brute force for a home invader to gain access. This isn’t even worth thinking about as there’s a few reasons why this isn’t something that anybody would attempt. As all our patio doors use double glazing, they require a lot of force to shatter and even if somebody was able to do this, it would create a noise so loud that they’d alert the attention of everyone around. Not to mention that if they were close enough to shatter the glass, there’s a strong chance they’d harm themselves in the process. You should now be confident in the belief that a bifold door will keep you and your loved ones safe, especially if you buy one from Emerald Home Improvements. Our Secured by Design status and FENSA accreditation means you’ll only receive products that are of the highest standard. It’s not only doors we offer, there’s also windows, conservatories, orangeries and a variety of other products. All our products are designed with your security in mind, so you don’t need to worry about feeling vulnerable in your home. For more information, get in touch with us or browse our website.